Description: A firm white sponge forming irregularly shaped lumps. 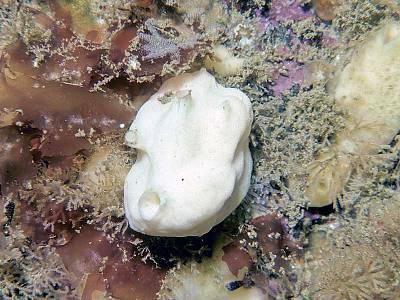 Its appearance is unlike other calcareous sponges. There are a few conspicuous oscules which have raised rims and are rather irregualrly placed on the sponge. Habitat: On rock in shallow water amongst red algae in fairly exposed open coast sites. Distribution: May be confined to SW England, rarely reported and possibly uncommon. Picton, B.E. & Morrow, C.C. (2016). Leucandra gossei (Bowerbank, 1862). [In] Encyclopedia of Marine Life of Britain and Ireland.